shalane flanagan | Run Inspired. I love Google+. I have met some amazing people through G+ and have learned a lot from other runners and fitness advocates. Although I haven’t actually met any of these people in real life, I still feel pretty connected to them. We share running stories, encourage one another, and every now and then have a hangout where we can actually chat. Hangouts are perhaps my favorite feature of Google+. It’s basically where a lot of people can get together and chat via a webcam – like a video conference. Well did you know that the New York Times has been hosting Google+ hangouts with some of the Olympic marathoners? Yea, I didn’t know it either. But perhaps if I had opened my Google Reader a little earlier, I would have known to submit my info so I could actually chat with Ryan Hall and Shalane Flanagan on Google+. How cool would that have been? But no worries – I still have my chance. They are interviewing Kara Goucher tonight at 6 p.m. ET. If you’re around at that time and are a Kara Goucher fan like I am, tune in here to watch what Kara has to say about the Olympics. And if you want to see was Ryan and Shalane had to say, you can watch a replay of the video. Here is Shalane and here is Ryan. Thank you New York Times and Google for putting this together. Now I even feel connected with a few Olympians. I love technology. I have a race this Saturday – a 5 miler in my hometown of Roxboro. I’m already nervous. Every time I think about toeing the start line, I get butterflies in my stomach. I started thinking this morning that I need to race more often so this nervous feeling goes away. Well then I realized this could get quite expensive so on to a different technique… visualization. At first I started visualizing I was Shalane Flanagan, but apparently that isn’t the way to practice this technique. I’m pretty sure she won’t be running by Northern Middle School on Saturday morning. Instead, here are some visualization exercises to help you get through your next race. I’m looking forward to practicing a few of these today. 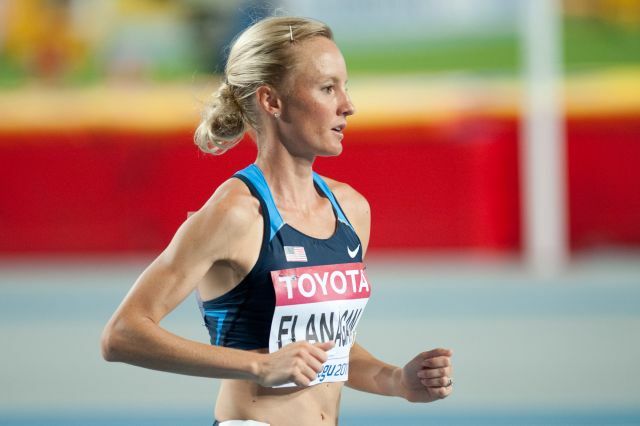 The third and final member of the Women’s Olympic Marathon team is Mrs. Shalane Flanagan, who has her own ties to North Carolina as a graduate from the University of North Carolina at Chapel Hill. Not my favorite school (Go Wolfpack! ), but nonetheless, it’s pretty cool the Olympian ran many miles just down the street from here. In fact, I saw on her Twitter page a while back that her favorite place to run in NC is the American Tobacco Trail. Now every time I’m out there running, I keep my eye out for a really fast blond girl with compression socks. I haven’t seen her yet – maybe after the Olympics. I’m keeping my fingers crossed. Shalane has it in her blood to be an amazing runner. Her mother set a world record in the marathon on her first try (Cheryl Bridges, 2:49), and her father was a World Cross Country Champion participant as well as a pretty fast marathoner (2:18). In school, Shalane had a pretty diverse background in running, swimming, soccer, and art. Her running skills are no different. Not only is she a pretty amazing marathoner, she is also a US record holder in the 3K, 5K, and 10K. 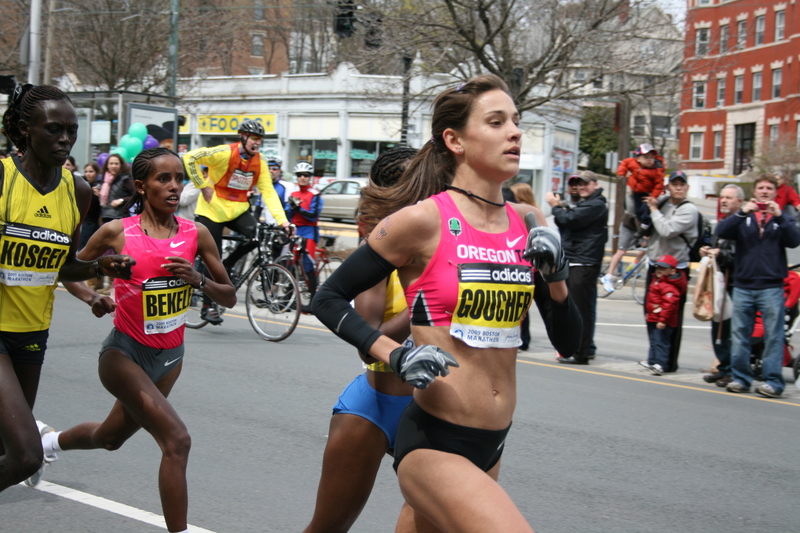 In the 2008 Beijing Olympics, she became only the second woman to win a medal in the 10,000 meters. Her time of 30:22:22 set a new American record (which was previously held by… well, herself), and got her a spot on the podium with a bronze medal. Some other random things about Shalane are she currently trains with team member Kara Goucher, she is married to Steven Edwards (also a track and field star from the University of North Carolina), and during a period of time when she was injured, it was discovered that she had an extra bone in her foot. Shalane has a blog that she updates about once a month, you can follow her on Pinterest, and her and Kara have some pretty entertaining videos with Innovation for Endurance. So there you have it. 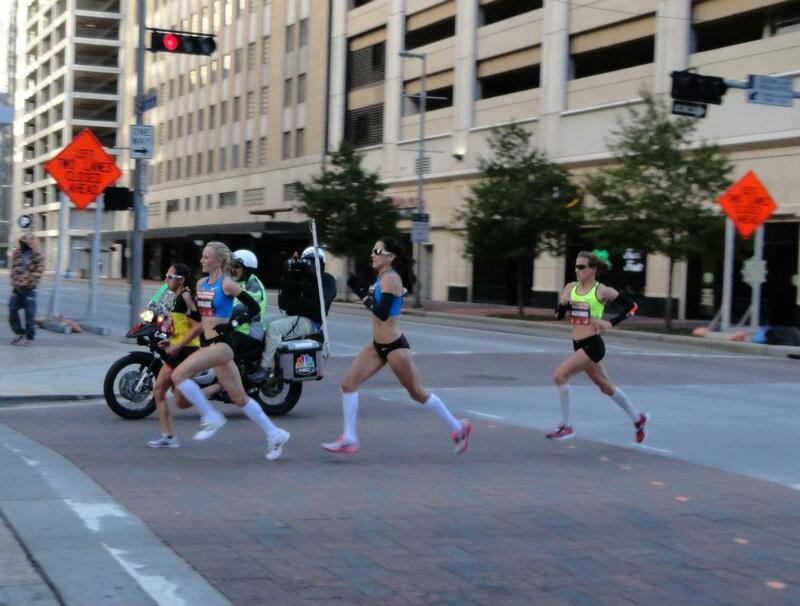 The three fabulous ladies competing in the marathon on August 5th. They are all amazing, classy ladies, with many great accomplishments and I am so excited to watch this event. And in all seriousness, I think I’m having a marathon party. Who wants to come?